Through its materiality and form, LOHA’s design for SL11024 seamlessly engages its historically sensitive site and challenging hillside topography and creates a new model for urban development that enriches an academic community. Sited opposite Richard Neutra’s Strathmore Apartments in the Westwood neighborhood of Los Angeles, this housing complex of 31 units and recreational amenities pays homage to its preeminent neighbor while providing the community with much-needed housing for students, faculty, and others on the border of UCLA’s campus. 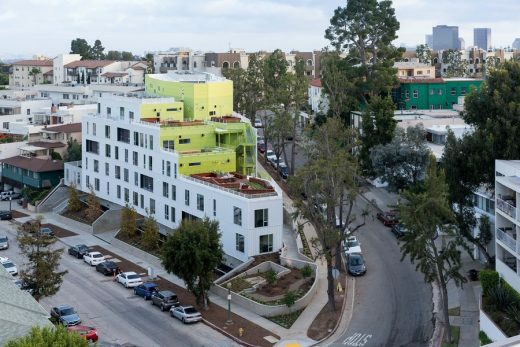 Following conversations with the client and community activists, LOHA developed a scheme that responds to the considerations of the established neighborhood, the client’s extensive program requirements, and the unique, wedge-shaped site. By splitting the building into two volumes, LOHA was able to efficiently integrate the structure’s overall massing with the existing landscape, provide wind cross-ventilation to the apartments, and define a clear circulation path through the property. 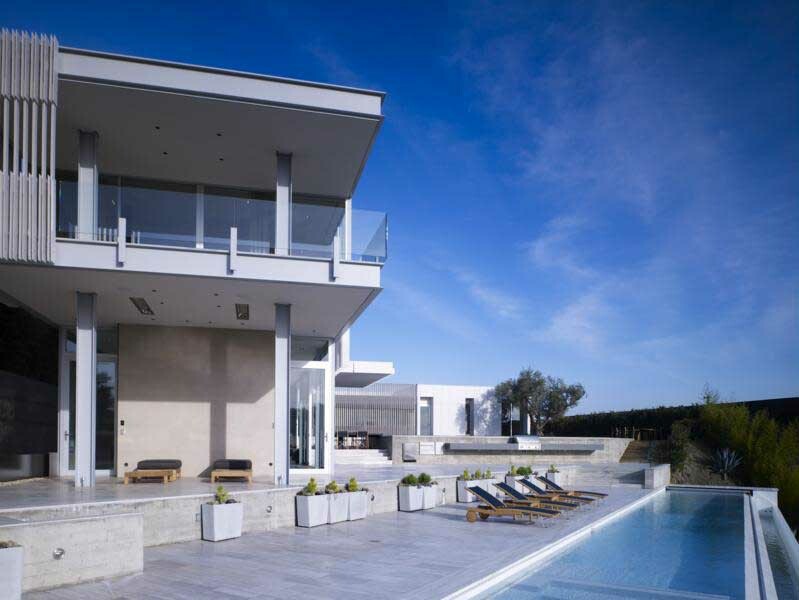 The building’s volumes shift downward along the street’s natural incline and reach their lowest height directly across from Neutra’s modernist landmark, thereby echoing and amplifying the enlightened site strategies of this high-profile neighbor. 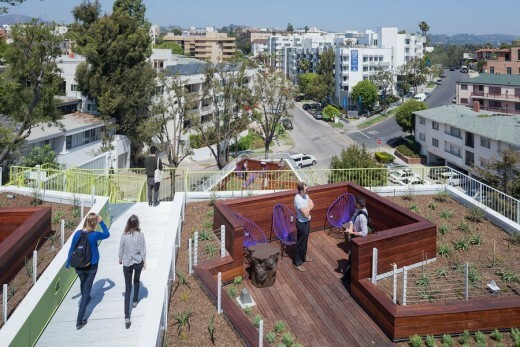 Continuing LOHA’s efforts to add green spaces into dense, urban developments, the building incorporates landscaped roof terraces at various levels, creating inviting outdoor areas for students. 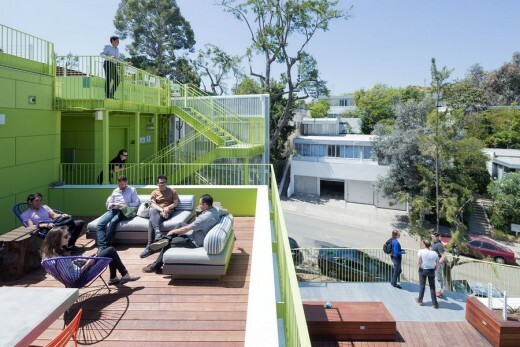 By stepping back the form, LOHA created access from each floor level to either a roof deck or a courtyard space, providing vital gathering and community-building venues. This continuous terracing of communal space from the street level to the roof results in a powerful urban and architectural gesture that offers a multi-layered connection both within the building and out towards the surrounding community. 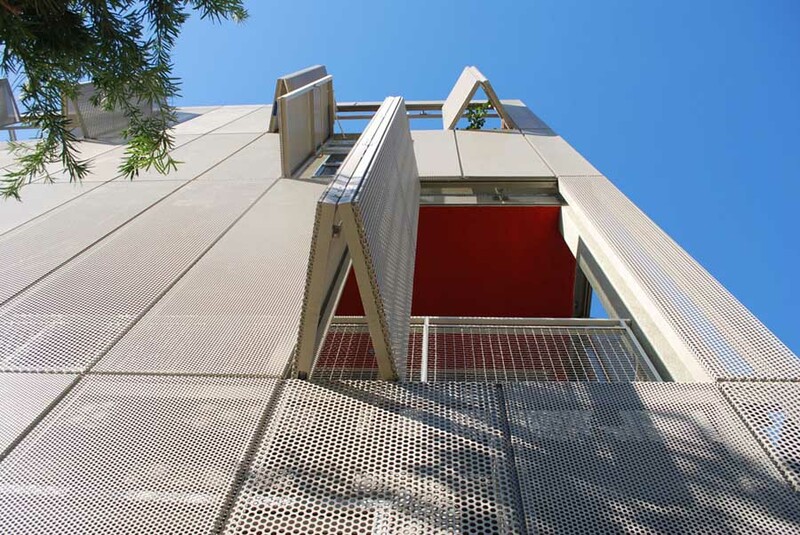 LOHA’s material choices for the building envelope of solid, perforated, and ribbed white metal panels project the vibrancy embedded within the project’s form, programming, and functions. 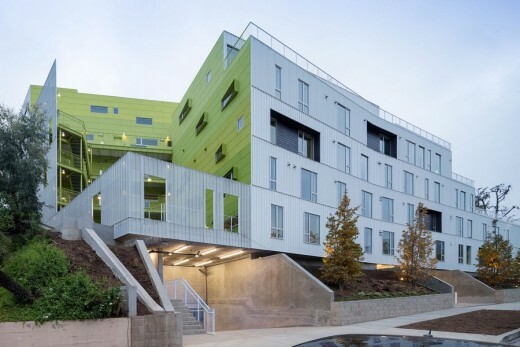 Cement board painted in eight green-hued layers creates a gradient effect that grounds the building’s base and lightens as the structure meets the sky. 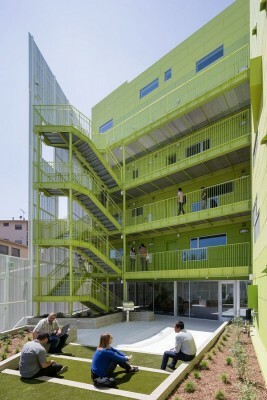 The green delineates cuts in the building’s form, indicating voids for circulation and gathering spaces. The cladding system blurs the boundary between the sidewalk and the building mass, creating an animated effect of rippling shadow and light that breaks up the scale of the wall surfaces. 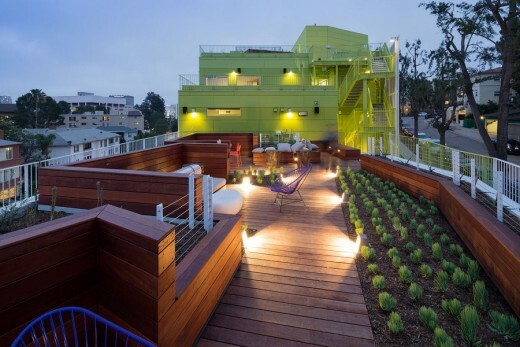 This project is a part of LOHA’s ongoing commitment to address and elevate challenging urban conditions. 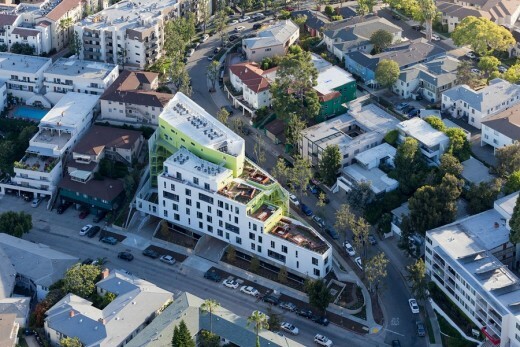 Here, LOHA embraced the unique topography of a hillside site to craft a multi-faceted building that is an asset to the increasingly dense and dynamic urban fabric of Westwood. Program: Off-campus housing catering to university community, including a fitness center, yoga studio, business center, and resident lounges.